Woodwards have been truck body builders in Merseyside since 1922, and although there have been many changes in the industry since then, our commitment to quality, service and the customer remains unchanged. We are a fully approved Tachograph and Top Speed Limiter Centre for all your Department of Transport (VOSA) legal requirements. 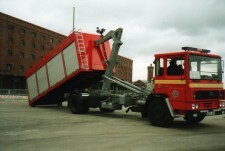 Not only do we specialise in commercial vehicle body work - such as hydraulics and ancillary equipment for the commercial vehicle and haulage industry, but also carry out custom bodywork ranging from van adaptations, both new build and conversions - to special custom built bodies for the Fire/Emergency Services. We have also built specialized trailers for use as laboratories, living accommodation, mobile workshops and mobile scanner units. Your enquiries are welcome. Welcome to ‘Woodwards SVS Ltd’, we have been truck body builders in Merseyside since 1922, and although there have been many changes in the industry since then, our commitment to quality, service and the customer remains unchanged. 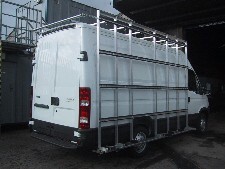 Not only do we specialise in commercial vehicle body work - such as hydraulics and ancillary equipment for the commercial vehicle and haulage industry, but also carry out custom bodywork ranging from van adaptations, both new build and conversions - to special custom built bodies for the Fire/Emergency Services.